Stretching like a long finger pointing at the Arenal Volcano, Lake Arenal in Costa Rica is one of the country’s most scenic points of interest. Green rolling hills of forest and pastureland surround the deep blue lake, with the near-perfect conical symmetry of Arenal Volcano framing the skyline to the east. 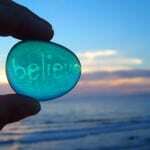 It is the country’s largest lake at 33 square miles (85 km2), with depths of up to 200 feet (60m). Lake Arenal plays a very important role producing nearly 12% of Costa Rica’s electric energy with its hydroelectric dam. Out of all of the things to do in Arenal, Costa Rica, Lake Arenal offers fun and unique Costa Rica adventure tours, like kayaking, stand-up paddle boarding, fishing and boating. 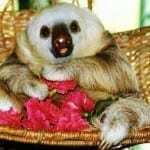 These Arenal Costa Rica tours are available with Desafio Adventure Company. 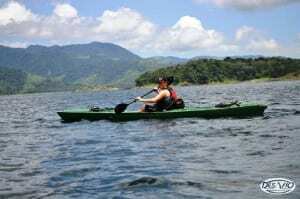 Paddle stable sit-on-top kayaks (double or single) for two hours around Lake Arenal enjoying the tranquility, views and wildlife. Exploring Lake Arenal by kayak gives you a completely different perspective of the massive Arenal Volcano and countryside. The Lake Arenal Kayaking Tour includes transportation, kayaking equipment, life vests, bilingual guide, snacks and beverages. There are two tours daily, in the morning at 8:00 a.m. and an afternoon/sunset tour at 1:00 p.m.; each tour lasts four hours. Lake Arenal is known for its colorful Rainbow Bass, also known as Guapote, a hard-fighting fish that can weigh over 12 pounds and is quite tasty. This is a nice, relaxing half-day tour. 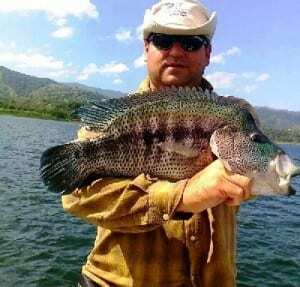 The Lake Arenal Sportfishing Tour includes bilingual guide, fishing boat and equipment, fresh fruit and beverages. The tour departs at 5:30 a.m. for best fishing conditions, and lasts six hours. 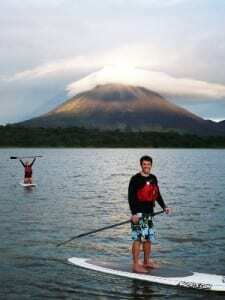 The hottest new sport of Stand-Up Paddle Boarding is lots of fun on Lake Arenal and relatively easy to learn. Called “SUP” for short, it involves standing up on a large, wide, buoyant board (similar to a surfboard) and using a long paddle for movement. On the tour, you will travel by boat to a calm spot on the lake where you will start paddle boarding. Lake Arenal Stand-Up Paddle Boarding Tour includes transport via van and boat, bilingual guide, paddle boarding equipment, and snacks. 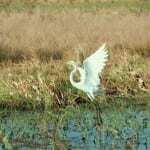 There are two tours daily, in the morning at 8:00 a.m. and an afternoon/sunset tour at 1:00 p.m.; each tour lasts four hours. This original tour by Desafio Adventure Company takes you out on Lake Arenal for a relaxing afternoon-sunset boat cruise. 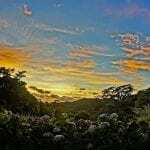 It’s ideal for bird-watching and great photo opportunities of Arenal Volcano. The “moonshine” part is homemade wine made from local nance fruit, to be enjoyed with cheese and plantain chips. The Lake Arenal Moonshine Tour includes transportation, bilingual guide, snacks and beverages. The tour departs at 3:30 p.m. and lasts three hours. A Fresh Water Beach on Lake Arenal?